Wild Radish (Raphanus raphanistrum) is a dicot weed in the Brassicaceae family. In Victoria this weed first evolved resistance to Group O/4 herbicides in 2011 and infests Spring Barley, and Wheat. Group O/4 herbicides are known as Synthetic Auxins (Synthetic auxins (action like indoleacetic acid)). Research has shown that these particular biotypes are resistant to 2,4-D and they may be cross-resistant to other Group O/4 herbicides. Greenhouse, and Laboratory trials comparing a known susceptible Wild Radish biotype with this Wild Radish biotype have been used to confirm resistance. For further information on the tests conducted please contact the local weed scientists that provided this information. There is no record of differences in fitness or competitiveness of these resistant biotypes when compared to that of normal susceptible biotypes. If you have any information pertaining to the fitness of Group O/4 resistant Wild Radish from Victoria please update the database. The Herbicide Resistance Action Committee, The Weed Science Society of America, and weed scientists in Victoria have been instrumental in providing you this information. Particular thanks is given to Peter Boutsalis, and Christopher Preston for providing detailed information. COSTA, L.O. and RIZZARDI, M.A.. 2014. Raphanus raphanistrumResistance to the Herbicide Metsulfuron-Methyl. In Press : . The ALS-inhibiting herbicides, especially metsulfuron-methyl, are widely used for weed control, mainly wheat and barley in southern Brazil. 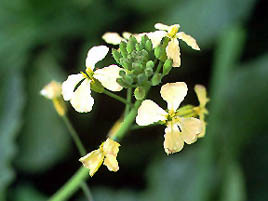 <em>Raphanus raphanistrum</em> is a major weed of winter crops. However, in recent years, <em>R. raphanistrum</em>, after being treated with metsulfuron, has shown no symptoms of toxicity, possibly due to herbicide resistance. Aiming to evaluate the existence of R. raphanistrum biotypes resistant to metsulfuron, an experiment was conducted in a greenhouse, in a completely randomized design with four replications. The plots consisted of pots with six plants. The treatments consisted of the interaction of resistant <em>R. raphanistrum</em> (biotype R) and susceptible <em>R. raphanistrum</em> (biotypes S) with ten doses of the herbicide (0.0; 0.6; 1.2; 2.4; 4.8; 9.6; 19.2; 38.4; 76.8 and 153.6 g i.a. ha<sup>-1</sup>). The application of the test herbicides occurred when the crop was at the stage of 3 to 4 true leaves. The variables analyzed were control and dry matter accumulation. Statistical analysis of dose-response curves was performed by non linear regression. Biotype S was susceptible to the herbicide even at doses below the recommended. Biotype R was insensitive to the herbicide obtaining values of resistance factor (F) higher than 85. The dose-response curve confirmed the existence of<em> R. raphanistrum </em>biotypes with high level of resistance to metsulfuron-methyl..
Jugulam, M. ; DiMeo, N. ; Veldhuis, L. J. ; Walsh, M. ; Hall, J. C.. 2013. Investigation of MCPA (4-chloro-2-ethylphenoxyacetate) resistance in wild radish (Raphanus raphanistrum L.). Journal of Agricultural and Food Chemistry 61 : 12516 - 12521. The phenoxy herbicides (e.g., 2,4-D and MCPA) are used widely in agriculture for the selective control of broadleaf weeds. In Western Australia, the reliance on phenoxy herbicides has resulted in the widespread evolution of phenoxy resistance in wild radish (Raphanus raphanistrum) populations. In this research the inheritance and mechanism of MCPA resistance in wild radish were determined. Following classical breeding procedures, F1, F2, and backcross progeny were generated. The F1 progeny showed an intermediate response to MCPA, compared to parents, suggesting that MCPA resistance in wild radish is inherited as an incompletely dominant trait. Segregation ratios observed in F2 (3:1; resistant:susceptible) and backcross progeny (1:1; resistant to susceptible) indicated that the MCPA resistance is controlled by a single gene in wild radish. Radiolabeled MCPA studies suggested no difference in MCPA uptake or metabolism between resistant and susceptible wild radish; however, resistant plants rapidly translocated more 14C-MCPA to roots than susceptible plants, which may have been exuded from the plant. Understanding the genetic basis and mechanism of phenoxy resistance in wild radish will help formulate prudent weed management strategies to reduce the incidence of phenoxy resistance..
Li Mei ; Yu Qin ; Han HePing ; Vila-Aiub, M. ; Powles, S. B.. 2013. ALS herbicide resistance mutations in Raphanus raphanistrum: evaluation of pleiotropic effects on vegetative growth and ALS activity. Pest Management Science 69 : 689 - 695. Background: Gene mutations that endow herbicide resistance may cause pleiotropic effects on plant ecology and physiology. This paper reports on the effect of a number of known and novel target-site resistance mutations of the ALS gene (Ala-122-Tyr, Pro-197-Ser, Asp-376-Glu or Trp-574-Leu) on vegetative growth traits of the weed Raphanus raphanistrum. Results: The results from a series of experiments have indicated that none of these ALS resistance mutations imposes negative pleiotropic effects on relative growth rate (RGR), photosynthesis and resource-competitive ability in R. raphanistrum plants. The absence of pleiotropic effects on plant growth occurs in spite of increased (Ala-122-Tyr, Pro-197-Ser, Asp-376-Glu) and decreased (Trp-574-Leu) extractable ALS activity. Conclusion: The absence of detrimental pleiotropic effects on plant growth associated with the ALS target-site resistance mutations reported here is a contributing factor in resistance alleles being at relatively high frequencies in ALS-herbicide-unselected R. raphanistrum populations..
Walsh, M. J. ; Stratford, K. ; Stone, K. ; Powles, S. B.. 2012. Synergistic effects of atrazine and mesotrione on susceptible and resistant wild radish (Raphanus raphanistrum) populations and the potential for overcoming resistance to triazine herbicides. Weed Technology 26 : 341 - 347. The synergistic interaction between mesotrione, a hydroxyphenylpyruvate dioxygenase (HPPD)-inhibiting herbicide, and atrazine, a photosystem II (PS II)-inhibiting herbicide, has been identified in the control of several weed species. A series of dose-response studies examined the synergistic effect of these herbicides on a susceptible (S) wild radish population. The potential for this interaction to overcome target-site psbA gene-based atrazine resistance in a resistant (R) wild radish population was also investigated. Control of S wild radish with atrazine was enhanced by up to 40% when low rates (1.0 to 1.5 g ha-1) of mesotrione were applied in combination. This synergistic response was demonstrated across a range of atrazine-mesotrione rate combinations on this S wild radish population. Further, the efficacy of 1.5 g ha-1 mesotrione increased control of the R population by a further 60% when applied in combination with 400 g ha-1 of atrazine. This result clearly demonstrated the synergistic interaction of these herbicides in overcoming the target-site resistance mechanism. The mechanism responsible for the observed synergistic interaction between mesotrione and atrazine remains unknown. However, it is speculated that an alternate atrazine binding site may be responsible. Regardless of the biochemical nature of this interaction, evidence from whole-plant bioassays clearly demonstrated that synergistic herbicide combinations improve herbicide efficiency, with lower application rates required to control weed populations. This, combined with the potential to overcome psbA gene-based triazine resistance, and, thereby, regain the use of these herbicides, will result in more sustainable herbicide use..